So much to discuss tonight. Where do I even begin? First, thanks to John Schultz for choosing this week’s blue-and-maize theme. We’ve got triple-fives heading into Final – but all of the Daily Doubles belonged to Leah. We’ll discuss that in a bit. I highly recommend you watch tonight’s video, as it captures my full disdain for what happened. 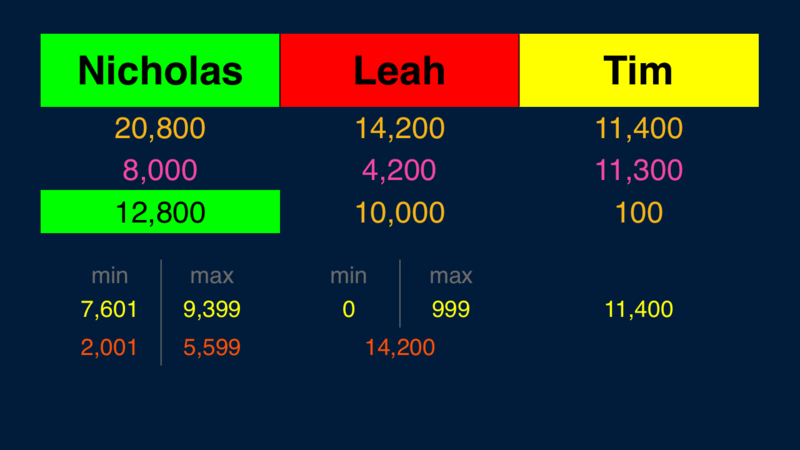 If Leah doubles her score, she’ll have 28,400. 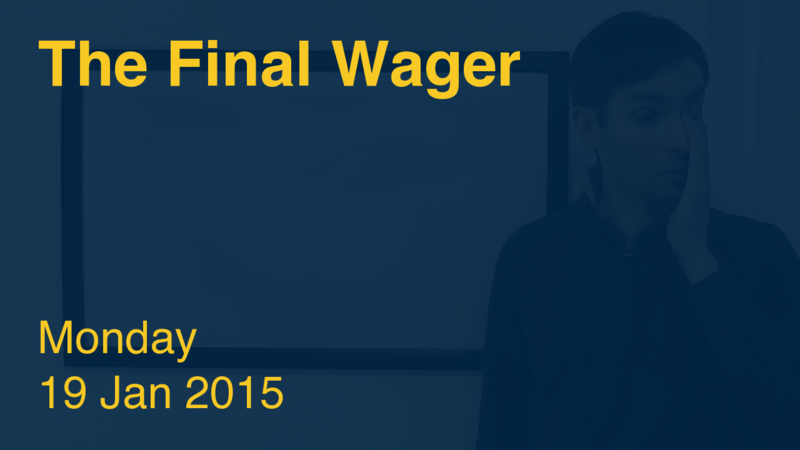 To cover this all-in wager, Nicholas will need to wager 7,600. An incorrect response with that wager will leave Nicholas with 13,200. 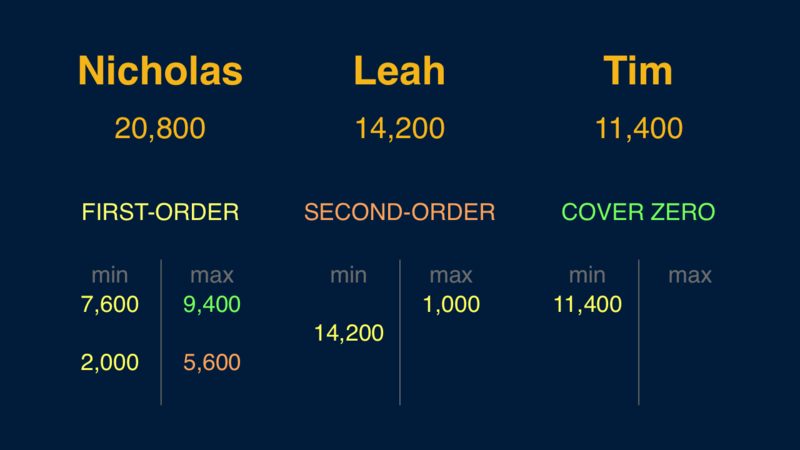 To stay above that total, Leah can wager up to 1,000; Tim must respond correctly to have a shot, so all-in is the way to go. A successful doubling will put Tim at 22,800. 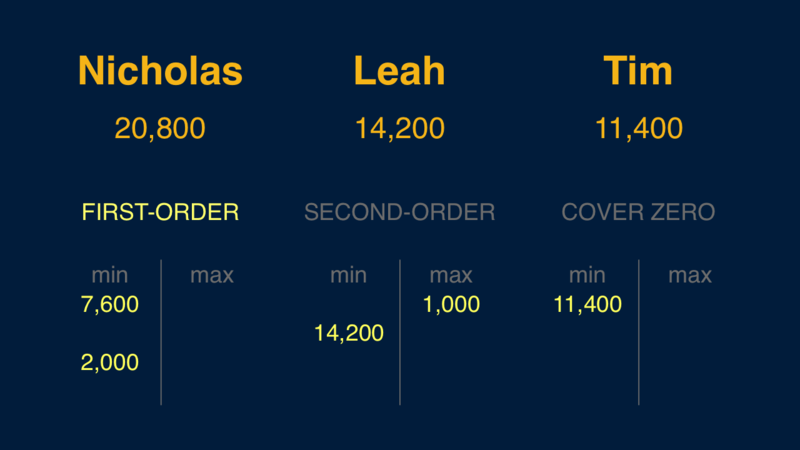 Leah should wager everything to cover him; Nicholas would need to wager at least 2,000. Leah is in a situation known as Stratton’s Dilemma. This scenario is clean-cut, though: she knows Tim is wagering everything, and she probably can’t win if Nicholas gets it right. If she thinks Tim will get it right, she should wager everything. If she thinks Tim will get it wrong, she should wager to stay above Nicholas on the double-miss (up to 999). When you can’t decide between two options, look at the second hand of your watch. If it’s between 0 and 29 when you look, pick the “first” choice; if it’s between 30 and 59, pick the other. Do not try to split the difference. That’s exactly what Leah did. The only way she could possibly win is if she’s the only player to respond correctly. By refusing to pick either good option, she effectively cut her chances of winning in half. Let’s say Leah were to just disappear here, leaving the guys to fend for that last $2,000 clue. If Nicholas nabs it, he enters a lock-tie scenario: exactly double Tim’s score. That means if Leah wagers to fall below Tim, there’s a reasonable chance she’ll be eliminated before Final Jeopardy!. Therefore, if she wagers more than $199, there had better be some serious upside. $600 doesn’t cut it. The only good wager larger than $199 is at least $11,201. What are Sotheby’s and Christie’s? In the last 10 regular games (counting tonight) in which we had three players in Final Jeopardy we have the following result: In 1 case all three got it right = easy. 3 cases of 1 right + 3 cases of 2 right = 7 ok and 3 cases of 0 right = hard. So that’s a “final jeopardy degree of difficulty = just right” score drops to 60%. The “average degree of difficulty” score (higher is harder) increases to 1.80. Today’s FJ was a triple stumper for the second day straight so the “no triple stumper on FJ” streak now stands at 0 days. Re: Nicholas’s fantastic sign-in: contestants do get as many chances to sign in as set-up time for the game allows, because there’s a “clear screen” button on the lectern wall accessible to them. Contestants do make use of it while signing in. I remember during my first practice, I had to use it because at first I signed in as “RKS” just to be different. Glenn Kagan, at Alex’s spot, shook his head at me and said, “Can’t play.” I hit the clear button right away and signed in with “Robert”. One does not do anything to try Glenn’s patience! Ah, good to know. That must have changed since I was on.